The Revenant is a new adventure/drama film directed by Alejandro González Iñárritu (Birdman) and partially based on the same named novel by Michal Punke, which is based on a true story. This film has been highly anticipated largely due to the success of last year’s Birdman, as well as the undeniable star power of Leonardo DiCaprio in the title role. He is actually my favorite actor ever and is one of the absolute best in the business today. DiCaprio brings his best every time, from his Oscar nominated performance (as a teenager) in 1993s Whats Eating Gilbert Grape to 2013s The Wolf of Wall Street and everything else in between. Personally, I feel like his best work is his portrayal of the villainous Calvin Candie in Quentin Tarantino’s Django Unchained. All of that being said, I just couldn't wait to see what he would do with this incredible project. 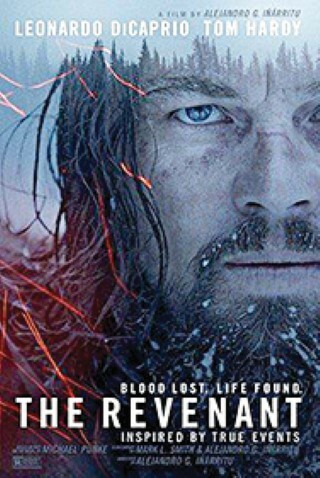 Taking place in 1823, Leonardo DiCaprio plays the famous frontiersman and fur trapper named Hugh Glass. Early on in the film, he gets brutally attacked by a grizzly bear and is left for dead by the rest of his hunting team. Now, Glass must put his unmatched survival skills to the ultimate test as he journeys through the uncharted wilderness of the American frontier in the middle of the winter. He finds himself hunting down John Fitzgerald (Tom Hardy), the former ally who abandoned him in the first place. This movie was an unbelievable project as it was shot completely with natural light in many different remote locations, primarily across Canada. Iñárritu’s hard work absolutely paid off as the cinematography in this film is truly breathtaking. There are more than a few wide shots in the movie that are some of the best I have ever seen in film. Leonardo DiCaprio delivers his best physical acting performance to date as he truly transformed himself while playing this character. Once again, he is worthy of an Academy Award and I really think this could be the one that gets him his well-earned trophy. However, the work from Tom Hardy in this movie cannot be overlooked as he was equally sensational in his supporting role. I will be shocked if those two don't earn Oscar nominations as well as a handful more for the movie. Overall, The Revenant is an outstanding achievement of a film that shouldn't be missed.